Canada got the Pink Paradise CRB. Canada got a Static Blossom Power Y and Enhearten Tank. Canada also got a Boom Juice Power Y.
Kara Blossom Wunder Under Crops and Pants. These are denim and people are saying they run small. Canada got a Pink Paradise Salute the Sun tank. 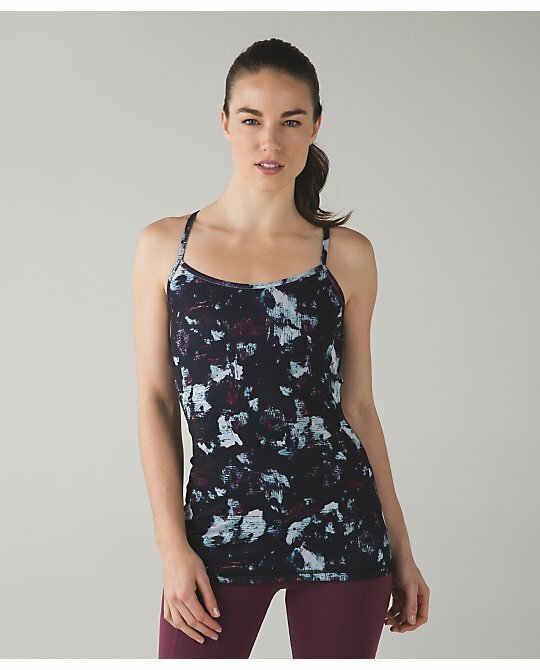 Canada got a very pretty Posey print Regal Plum Swiftly SS. The US got the Essentials bag. I ordered the solid black one. Rio Mist Get Down Bra. I am tempted to order it but it looks way too low cut for me. Heathered Black/Deep Coal/Flare Pace Rival Crops. These look identical to the Boom Juice version except for the color of the zipper and inside of the waistband. It looks like Canada was the winner for this upload. Just the Essentials bag for me. Did you get anything? What a total bummer on the US side. If we don't get the pink CRB I will cry. And that grape Energy bra is so autumn. Boo, lame. I was excited just to see new Run Times prints! Got a couple of those to try. Canada got....Canada got...Canada got. I don't know why US and Canada cannot get the same stuff uploaded at the same time. Have to say I'm getting really tired of the games Lulu plays. Saw the Essentials Bag in person and wasn't impressed. I like my Festival bag much more as far as function, opening and convenience. @ anon 4:33 pm - Interesting on the Essentials bag. Maybe I won't like it and will save $68. I placed my first order in more than three months. I ordered the White DSPs (will be the first time I try the IIIs) and the Radiant Wrap. I sized down in the Radiant Wrap - hope that was the right thing to do. I have wraps coming out of my ears but I live in my Coast Wraps and this looks similar. I tried the get down bra in store today. I am usually a 4/6 in energy and the 8 was too small-straps are super short. This is the first $200+ order I've placed with lulu in ages. Bought Hero Blue HTs, Slate CRB (idk how I've managed to not have this color in my 5 yr-accrued crb collection), The Essentials bag in black, and a WTS tee for my daughter. I actually liked quite a few things on US side for once, but I'm to the point where I have to know I'll reach for it or I'm not shelling out the $. Is the Kara Blossom backed in white? In some of the pictures it looks like it might be. I hate when they ruin good prints by backing them in white. I just don't think it looks as nice (dandy digie, i'm looking at you). The new DSP IIIs look so weird with the slimmer straight cut legs. I don't like the look at all - they don't look at all feminine to me, they now look more like how men's pants are cut. Gross. There is no way that new bra would work for me. I can tell by how it looks on all the models. I actually love that it has shorter straps (someone above commented straps are short) I'm one who needs short straps or who needs to be able to adjust the straps quite short. I am just fitting into the size 32E Ta Ta Tamers but if the cups were any smaller I'd be out of luck, and I have the straps adjusted shortest they will go). I really love the Ta Ta Tamers anyway, but once in a while it would be nice to have a few bras in a different style for a change that would work for larger busts. I'm happy as long as they keep the Ta Ta Tamers coming in E cups in all the new colours! Tried on the restore wrap in store today, and loved the tailoring in the back. From the front not so much - too similar to the coast wrap! The placement of the buttons is identical, but they fixed that uneven hem thing on the bottom in the front.. Really bothered me on the coast wrap! Loved the red grape colour! The store also had a heathered navy blue, which didn't make it into the upload tonight! The red grape is too similar to my heathered Bordeaux wrap up jacket, so I didn't end up buying it! 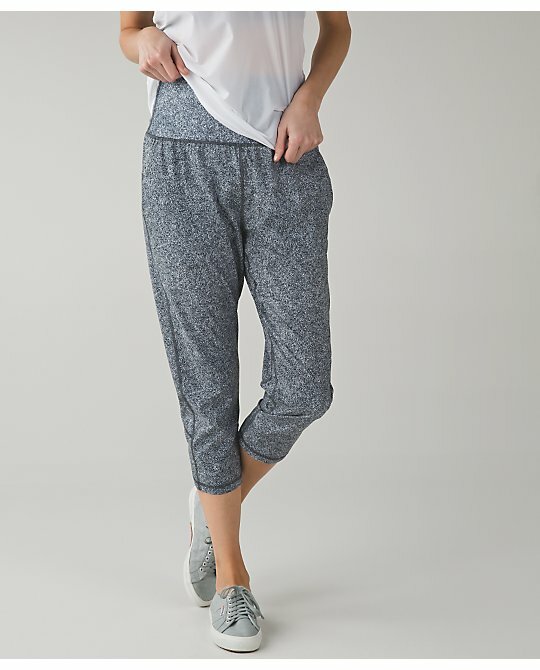 I tried the Kara Blossom Wunder Under Pants in store today. These do run small. They are denim with white backing. I was anxious for the upload...I assume we will see new colors and design after looking at what's happening with other countries' downloads. I see the colors sea mist and regal plum are back. Didn't we just see those two colors? I am not sure why they do not bring back heathered menthol particularly in swiftly short and long sleeve? Also, what happened to the Turn Jacket, for example? Canada got it and sold out in a real, real short time. In general, I am happy with the most of the colors but I think some are pretty redundant. I will not be buying anything in regal plum or sea mist. I will be patient for Alberta and Heathered Menthol as I am still matching items to go with these colors. Also, I think that LLL still needs to 'perfect' and tweak certain items like On the Daily Hoodie. When they consistently get reviews that the fabrics are too scratchy and irritate their skin or the fabrics changed, LLL should take heed. 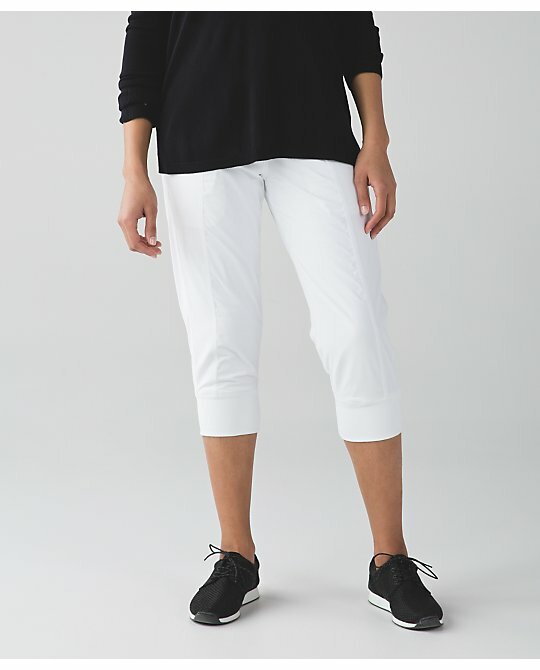 I ordered the white Street To Studios and if they are not too sheer I will have them hemmed to be more like crops! In store this a.m. I tried on the white lined In Flux but I just don't like the fit and style not to mention they replaced my beloved Dance Studio Crops so I refuse to buy them. I saw the Regal Plum Posey Print Swiftly and I actually liked the tone on tone print. I really liked the colour but it's too similar to my ultra violet one I bought months ago. I also tried on the Restore Wrap but couldn't get the button in the button hole which was so frustrating! I know people who have the Coast Wrap who have that issue with the button not fitting easily in the hole. I really liked the detail in the back but the front is nothing new. I tried on the Inkwell which had Red Grape trim on the pockets. There have been so many wraps this winter and I have That's A Wrap which has the same neckline as this one but I like the curved front hem on That's A Wrap better and a snap closure that doesn't cause frustration. I don't know why they are advertising this wrap as on-line only when my store had it in grey, red grape and inkwell. What did you think of the fit ? True to size or bigger ? I just ordered the Pink Paradise CRB (better not be sheer over my bust! 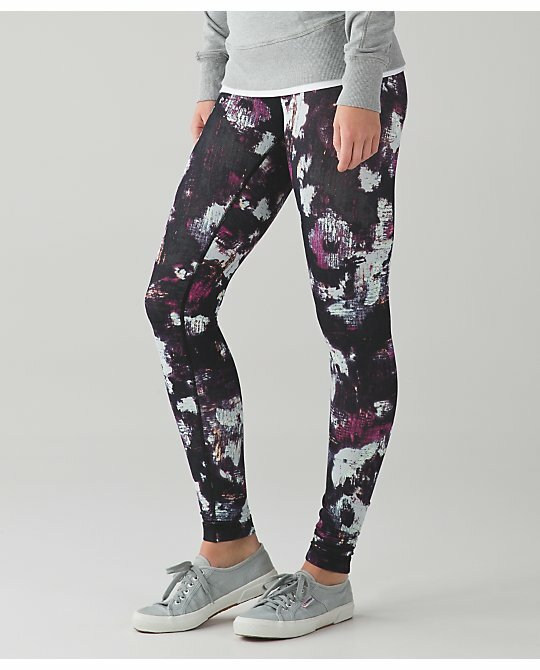 ), the Regal Plum Long Sleeve Swiftly, the Posey Print Regal Plum Short Sleeve Swiftly(love this in the Posey floral print! ), and the Rio Mist Black/White Print Ta Ta Tamer. I really want the White Daily Practice Jacket too, but I'm going to wait for a bit, I made a big enough order tonight. Also now that I see that gorgeous Pink Paradise LS Swiftly that Hong Kong got I'm wishing for it now too! Oh my goodness, I need therapy for all the spending I've been doing recently, I'm not being very good about it that's for sure, I need to stop being so greedy, it's not like I really need most of this stuff. Why so much regal plum? And the US upload was so lame. My wallet is happy though as we have another bigger purchase to make in the next week lol. 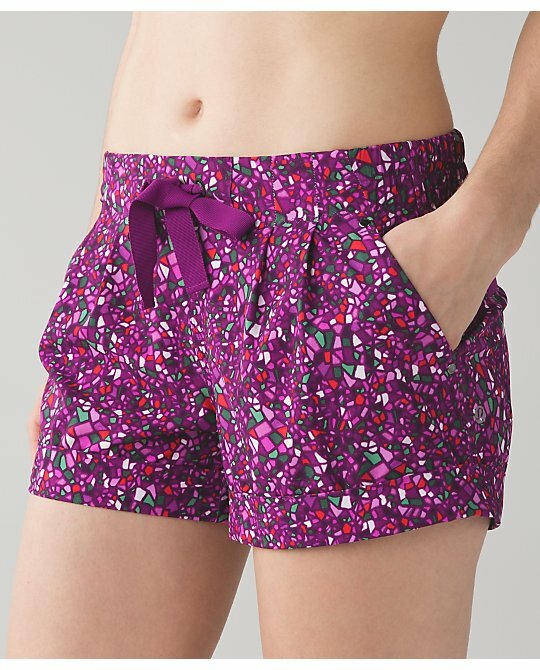 But I do want to try the spring break away shorts. I might like those for Disney. Does anyone know if the heathered slate CRB is the light/thin material? I bought the kara blossom WUC today, they do run small so I sized up and they are opaque. 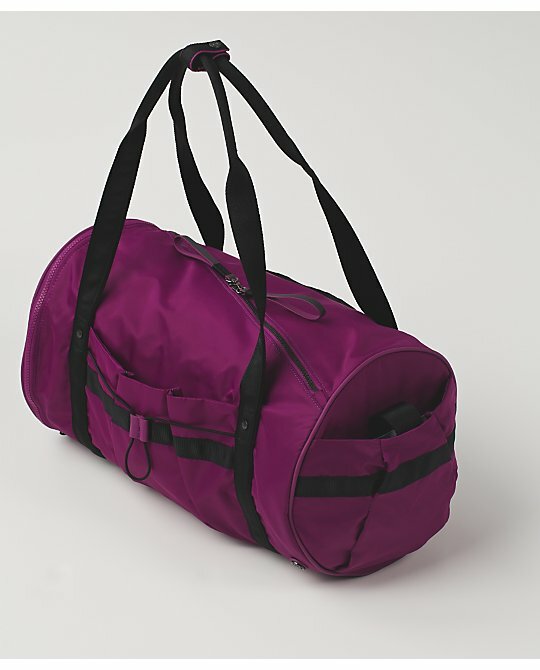 I'd like a small shoulder bag, but the Essentials bag looks like a Le Sportsac to me. I bought the Essentials bag in black today at the store. I almost bought the Festival bag in January but found it heavy with all the hardware. The straps were also a bit of a hassle to switch around to go from fanny pack style (which I think would be useful on vacation) to regular carrying style. I would be using it mostly for vacations so the lighter the better. The only thing the essentials is missing is a metallic clasp for the flap. 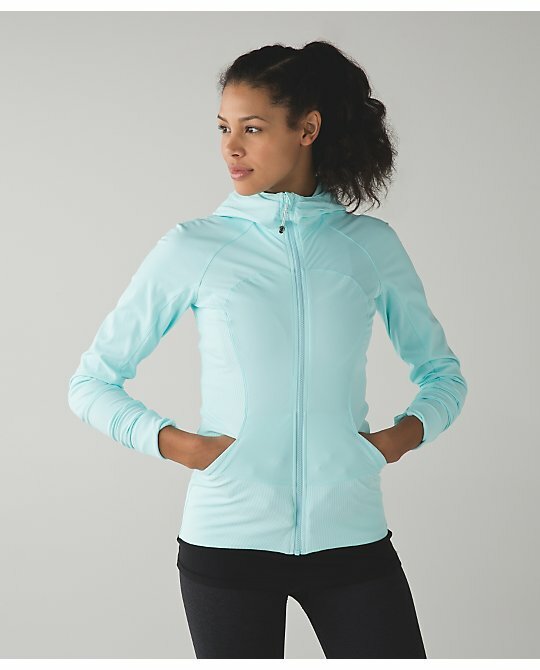 Yes, you can zip it up but sometimes it's also fine to just let flap latch without zipping. Would've been a cheap add on. Anon 7:16pm I found the fit tts. I wear a size 6 in jackets and my That's a Wrap is a size 6 as well. As the back of the Restore Wrap is more fitted it feels a bit more snug than That's A Wrap but the front is plenty roomy. If the front of this wrap had been styled differently so it didn't look the Coast Wrap or That's A Wrap I would have bought it in the Inkwell colour. I would also love to hear your thoughts on the essentials bag. Any way you could do a side-by-side comparison with the festival bag? I bought the festival bag recently but haven't taken the tags off so I might end up exchanging it for the essentials bag for an upcoming trip to Disney. 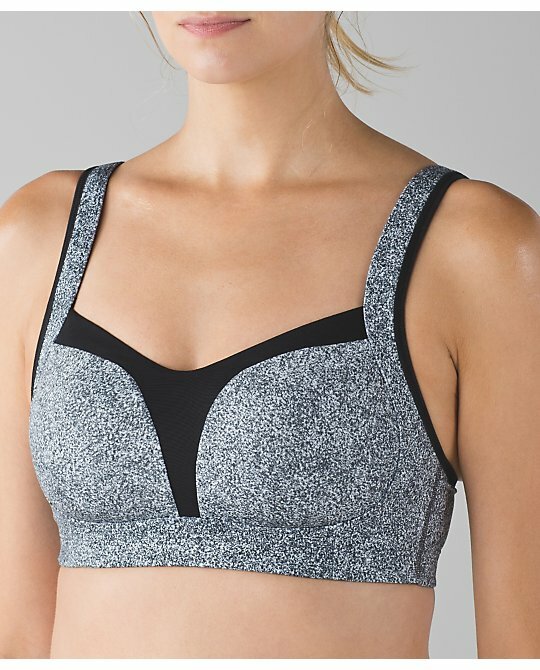 Anyone know what that top/bra combo is with the flare pace rival crops? Looks interesting... Also a new dress on the what's new page that looks like a fun beach cover up? I checked it out in the store yesterday. It's light luon, so a bit on the thin and scratchy side! My usual size 10 was waaay too big on me, so I sized down to an 8. The fit is really relaxed and roomy, if not a bit too boxy. You can't see the shape of your waist from the front, so not the most flattering fit in my opinion. I forgot to add earlier that the button was really tough to fit into the hole as well, so no improvement there from the coast wrap. Opening: The Festival's zipper flap being the opening make it so much easier to get inside the bag itself as the opening is wide. I never keep my Festival bag zipped closed since it flops over I feel very safe leaving it unzipped. Because of that, getting in and out is so fast and super easy. The Essentials bag opening not being the flap was small and narrow. I had to work at getting my wallet (large Coach) into it and struggled to pull it back out. I'm not going to change my wallet every single time I switch out my purse so that in itself was enough to make me put it back. 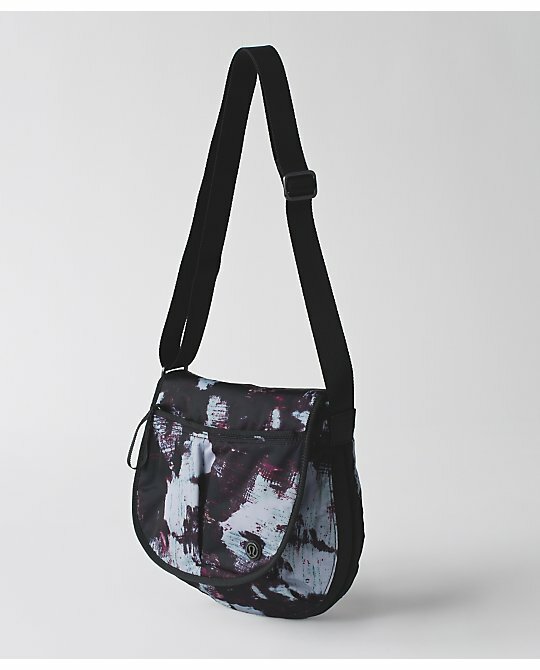 Outer pocket: On the Festival bag it's open, non zippered but the zipper flap folds over and snaps closed. This is where I keep my phone, chapstick and hand sanitizer. Super easy to get to and put away my phone one handed without ever even having to stop, look, find etc. The Essentials bag section here is zippered. For me, this just doesn't work or I'd end up leaving it unzipped thereby defeating the whole purpose of the design. Overall, once I put all my crap into the Essentials bag I found I had to dig more and struggle more to find what I was looking for since the opening is so much narrower than the Festival. With my Festival I open the flap and can see everything I need and grab what I want. I couldn't do that with the Essentials bag - it was a much bigger struggle to find things and pull them out and put them back in. The Ed's at the store were curious so we were doing this all together and all of them voted Festival hands down after this little experiment. Depending on what you carry, YMMV but with what I carry and use constantly the Essentials bag was good in theory but horrible in real life usage. @ anon 8:01 am - Good to know about the opening. If I can't get my fat wallet in and out of the bag I can't use it. That is one reason I love the Go Lightly bag - I love the top zipper opening. I actually sold my festival bag since it was a pain to get into compared to the Go Lightly. Was the length similar to the coast wrap, or longer? I wonder if the navy will make it to the website. I'd loves navy wrap. What store are you at? Those Pace Rivals look like they have a stain on them! Way to go, LLL. It's definitely not my screen. Thanks for the comments on the essentials bag. Sounds like not great enough to order in addition to the festival. Same! I've been trying really really hard to cut back spending after realizing how much I've wasted and I still have items with tags on! And, turns out some items I've HAD to buy, I don't care for so much anymore a few weeks later :- s. So I'm now 17 days into a spending freeze at lulu and the two items I think I NEED are that paradise pink crb and FTBW bra. Since they are not gone yet, I'm going to try last 1-2more weeks and see if I can make it a month!